Ewing Receives Bronze Level Sustainable Jersey Certification! 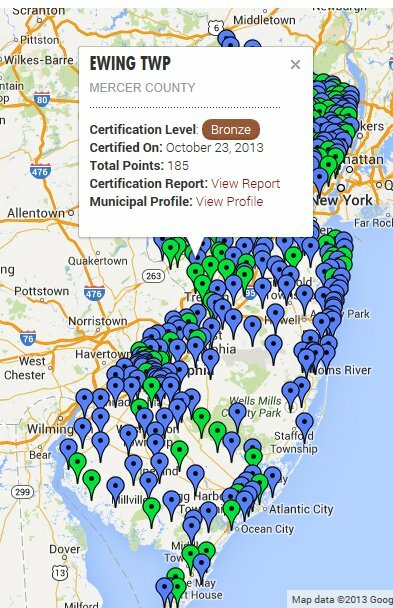 The Ewing Green Team is delighted to announce that EWING TWP has just been awarded bronze level Sustainable Jersey certification for 2013! The team, working in cooperation with the Ewing Environmental Commission, has worked for much of this year to document the many actions that the township has taken to make Ewing a more sustainable community. These actions range from running a Green Fair, to performing energy audits on municipal buildings, to enhancing our community gardens, recycling and waste reduction efforts and much more. As Ewing residents we are delighted to live a in town that values our natural resources and wants to do its part for the environment. This is a time of great change and excitement in town. Not only have we now become a SJ certified municipality, we are also at the beginning of a long-awaited redevelopment project at the former GM site which will create a new town center with housing, retail, community space and transportation. We invite other Ewing residents to join us and become part of a continued green transformation in our town. Previous Previous post: Thanks, Sustainable Jersey!